It’s that shucking time of year when bivalve lovers from near and far join Salty’s in the coolest shucking event in Seattle and Portland. 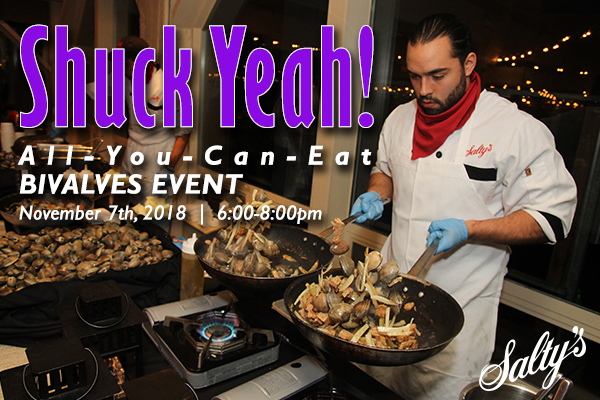 Salty’s Shuck Yeah All-You-Can-Eat Bivalves event is on Wednesday, November 7th at Alki Beach and on the Columbia River in Portland. Grab your bibs and bring your smile because this is sure to be a fun event. From 6-8pm, you’ll get to feast on local seasonal oysters, mussels and clams with an all-you-can-eat buffet of Salty’s Caesar salad, chowder, seafood paella and our festival mussel rigatoni. Make sure to come on an empty stomach because you’ll want to eat everything. We look forward to seeing you.